It seems fitting that as we head towards summer at a blistering pace, one of the hottest trends of the moment is the one we're calling Tropical Heat. 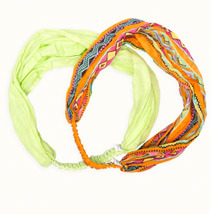 From the catwalks to the streets, fashion is blooming with hothouse brights and fun Hawaiian prints. 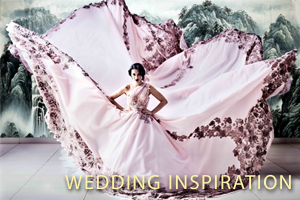 Hibiscus and jungle motifs mixed with splashes of solid, tropical colour are raising the temperature. Mix Hawaii 5.0 prints with smaller, more concentrated print pieces. Semi-sheer sleeveless blouse has a tropical forest print. Dot and floral print, adjustable straps, a sweetheart neckline. 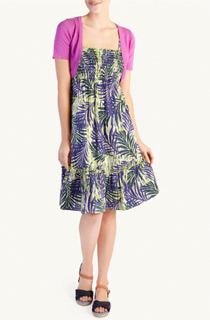 Topical and this palm printed smocked bandeau dress. 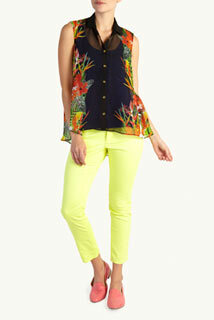 Pair a tropical blouse with a pair of colour-pop skinnies or shorts and sandals or wedges. 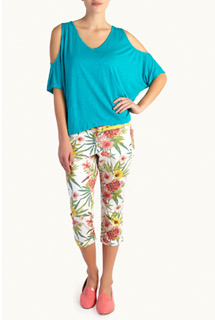 Cropped cotton capri pants with turn-up hems. 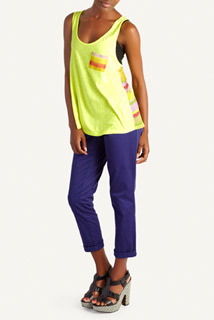 Luminous bright colour has show-stopping appeal on these cropped 7/8 pants. The tropical look has an irresistibly quirky edge to it - look out for fruity jewellery, parrots prints and printed flatforms that will take you from Muizenberg to Malibu in a flash. 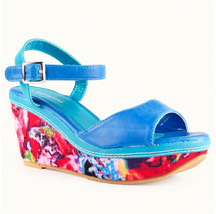 Floral fabric covers the wedged heel of this summer sandal. 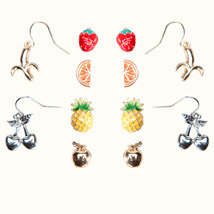 A quirky treasure trove of tropical fruit-inspired earrings. Hi-low ovoid hem with island-style flower theme. Silk-look jogger shorts with a smocked waistband.